Dual Pane file management is synonymous with productivity and ease of use. It combines comfort, speed, and power in the most natural way, namely by letting you look at the contents of two folders side by side. If you are new to Dual Pane you will quickly get used to it. If you come from a "Commander" style background then, of course, you can't even breathe without Dual Pane. 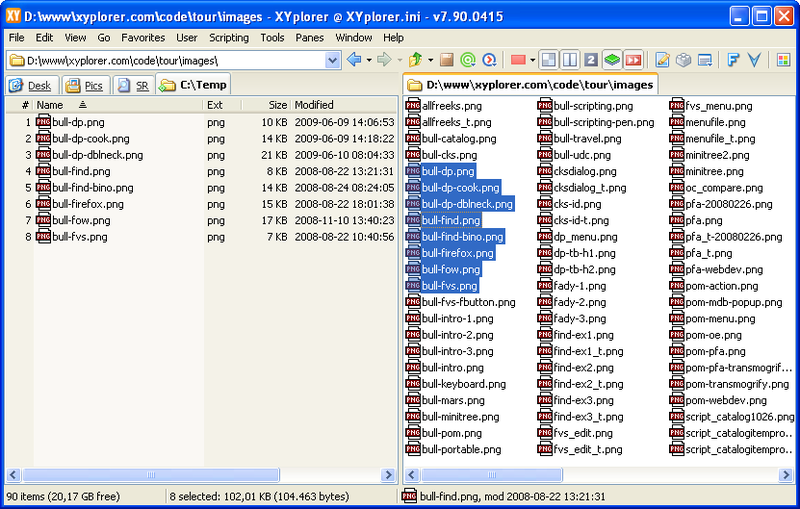 Now with version 8.00, the switch to XYplorer is possible for you, and you may never look back! F10 (configurable) toggles between Single Pane and Dual Pane mode. Alternatively click the Toolbar button "Dual Pane". Toggle between Vertical Panes or Horizontal Panes using menu Panes | Horizontal Panes (Ctrl+F10), or the context menu of Toolbar button "Dual Pane". In Dual Pane mode, one pane is always the active pane, the other one the inactive pane. The inactive pane has a shaded background color (configurable). To activate it click anywhere into the inactive pane, or use the menu command "Toggle Active Pane". You can also configure the TAB key to swap the panes. In the following you'll see various ways to improve your work flow using Dual Pane. Toolbar: Dual Pane enabled, vertical panes, first pane active. Copy to Other Pane (Before). Copy to Other Pane (After). 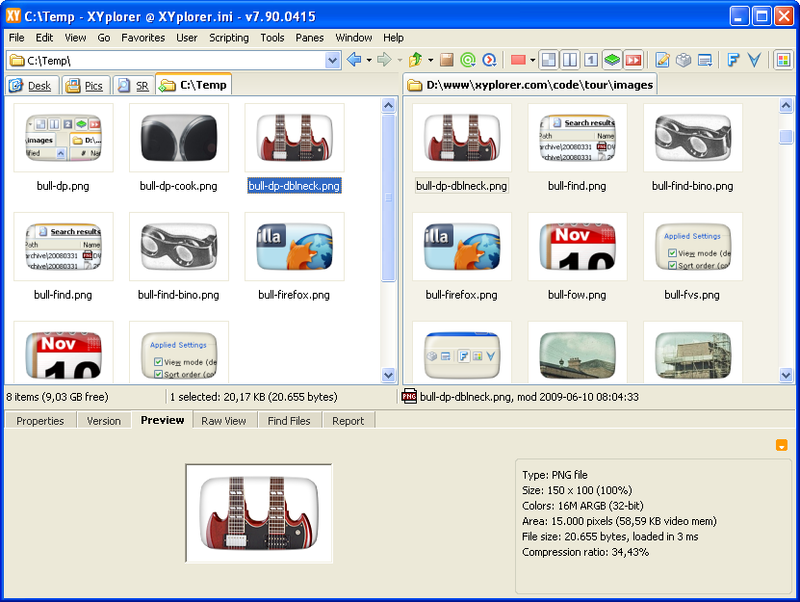 Note that the Folder Tree has been turned off in these screenshots. If you are experienced with a tabbed file manager like XYplorer you might not need Dual pane as much. Still, having the target list visible when carrying out folder-to-folder file operations provides a certain comfort factor unmatched by anything else. 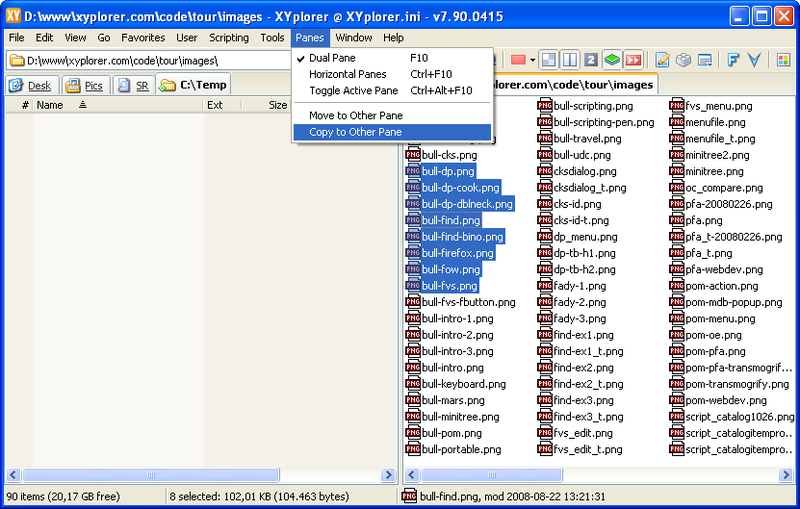 XYplorer's implementation of Dual Pane supports all sorts of pane-to-pane file operations, using the menu, the keyboard, or drag'n'drop. Typically you select the items you want to move or copy and drag them to the other pane where they appear immediately after the drop. It cannot get simpler than that. In XYplorer, both panes are multi-tabbed, and you can as well drop items right on the tab headers of each pane. Or onto folders listed in any of the panes. Using Customize Keyboard Shortcuts (menu Tools) you can assign any key combination to the main commands Move to Other Pane and Copy to Other Pane. 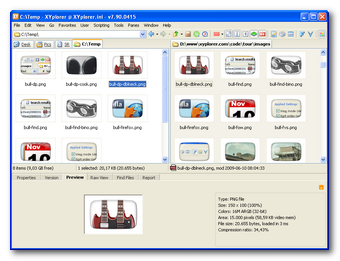 Dual Pane allows for easy visual comparison of files, usually images, that reside in different folders, or in one folder but on different ends of the list. Using the TAB key you can quickly jump back and forth between the panes to compare the focused items. The Info Panel at the bottom of the window always points to the active pane. Toolbar: Dual Pane enabled, vertical panes, second pane active. Even in Single Pane mode, Dual Pane technology can considerably enhance your productivity. Because each pane can be your single pane. The toolbar button "Toggle Active Pane" always tells which pane is active, "1" or "2". So, with a single click or keystroke, you can switch between two completely independent tab sets! For example, you might use the first pane for your current projects and activities, and use the second pane as a store for general tasks, be it a collection of certain favorite folders, or an array of often used searches, each defined in its own tab. To browse a folder in the inactive pane use Alt+Click in the Tree. To open a folder in a new tab in the inactive pane use Shift+Alt+Click. Double-click the pane splitter to center it between the panes. This page has been written 2009-06-10. The screenshots don’t reflect the current look of the application. Some of the functionality might have been changed or enhanced in the current version.